So you’ve gotten into the agricultural development business, maybe even right here in Greeley. Well, we at AGPROfessionals think that’s just great. Having your own plot of agricultural land, whether it’s for a dairy farm, feedlot facility, crops, ranching, or other use can be extremely rewarding and beneficial – not only for you, but for your family as well. As beneficial and rewarding as it is to run your own farm or ranch, it’s also a heck of a lot of work, especially during the hot summer months. AGPROfessionals knows that first hand, which is why we’re in the business of making your agricultural development in Greeley (or one of our other great service areas) as easy as it can be on you. 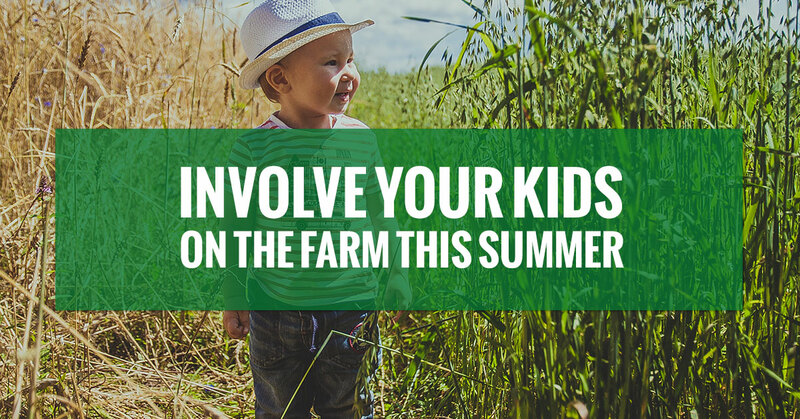 That’s why in addition to the second-to-none agriculture real estate advice, agricultural consulting, ag engineering, surveying and geotechnical, and financial services we provide, we thought it would be a good time to lay out some reasons why you should involve your kids on the farm this summer. So come along and find out how your kids can help you while you help them! One of the greatest benefits of involving your kids on your family farm is the lessons it will teach them. Farm work, as we all know, is hard and tedious, requiring a large responsibility, extensive knowledge, dedication, and precision. Farm chores require you to be punctual, which means they will have to set their alarm and get their required tasks done in the time specified, or else risk dire consequences. If you have livestock or other animals on the farm, you are responsible for the livelihood of your stock, which means missing out on feeding time or maintenance can affect their health. Teaching your kids about the life cycle of farm animals and their needs through hands-on learning will also help them form compassion and empathy, which can have great benefits when it comes to school, sports, and life in general. Furthermore, giving them extra incentive to work (like an allowance or wage) will get them even more motivated to accomplish their daily chores. This can help them earn their own money, which they will then need to learn how to be responsible with as well. Making sure your children understand the values of hard work will go a long way towards teaching them discipline and responsibility. Another nice benefit of involving your kids on the farm is to alleviate pressure or stress that you may feel. If your tasks are growing longer as the days grow shorter, enlist the assistance of your little farm hands to help keep your agricultural land tidy, proper, and efficient. Have them lend a hand with day-to-day projects like mowing, feeding, building a fence, or general maintenance so that you can focus on the bigger picture. If your kids have interest in things like math or accounting, show them the business side of things and how it operates, so that one day they can take over that responsibility and keep your books in order. This will make them better managers and overall increase their value and knowledge, which can also help in school and life. Eventually, the time may come for you to give up your farm. You may even want to set up a contingency plan should you die. Getting your kids involved with the operation of your farm will give you the safety net you need to have peace of mind when it comes to thinking about the future. The more they know about the overall operation, from daily chores to the business end, the better equipped they will be to inherit the family business when the time comes. In the end, isn’t that what agricultural development is all about? Leaving something behind for our family, and for future generations, is vital to our business. If you’re looking to get into agricultural development and need help with real estate, development and site planning, or financing, then contact AGPROfessionals today!